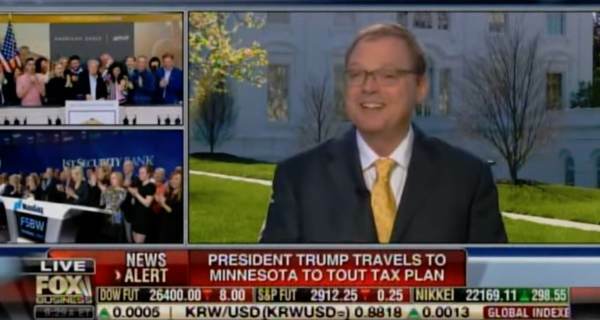 Chief of Economic Advisers Chairman Kevin Hassett joined Varney and Co. on Tax Day Monday to discuss the booming Trump economy. The Trump economy continues to be the most ignored national news story. Hassett told FBN disposable income for the average American went up $2,300 in 2018. The Trump economy created almost 2 million more jobs in 2018. Hassett then argued the economy can expect 3% growth for the next five years under Trump leadership. Here are more economic figures from the RNC. 82% of middle-class Americans saw a tax cut in 2018, the average savings was more than $1,260. Thanks to the Tax Cuts and Jobs Act, 90% of workers saw an increase in take-home pay after the IRS adjusted withholding tables to reflect the new law. These gains were reflected in the 3.3% wage growth during 2018, the best in a decade. As promised, the Tax Cuts and Jobs Act accelerated job growth by nearly 25%, pushed unemployment to historic lows, and kickstarted stellar GDP growth. The Tax Cuts and Jobs Act doubled the Child Tax Credit, the $1,000 increase saved working families more than $100 billion. The bill also expanded the refundable portion of the credit, a provision that helps primarily low-income families.